Following the Douro River through Portugal and into Spain, you’ll cruise past steeply terraced hillsides, quaint villages and acres of ripe vineyards. 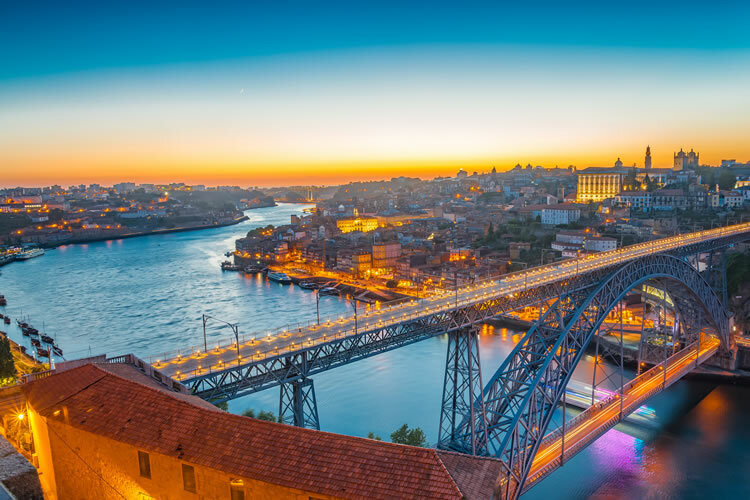 Dine on traditional fare in majestic Coimbra, the birthplace of six Portuguese kings; enjoy private tastings of Port; and explore Porto’s historic Ribeira district, home to iconic rabelo boats, cutting-edge cuisine and a thriving art scene. Wind your way through the dramatic landscapes of the UNESCO-designated Douro Valley, heading ashore to visit charming quintas and meet the winemakers who operate them. In Salamanca, Spain, you’ll see the city’s famous university and take in a high-spirited flamenco show. Return to Portugal with a visit to the fortified village of Castelo Rodrigo and historic Guimarães. There’s no better way to discover Europe’s best-kept secret than this scenic and all-inclusive river cruise! Arrive at Porto Airport before being transferred to your ship. Included Excersions: Choice of Exclusive “Do as the Locals Do” Porto walking tour or Porto city tour. Included Excursions: Douro Museum & Quinta da Avessada wine estate visit with lunch. Today is all about wine, which has been cultivated in the Douro River Valley since ancient Roman times. Get a crash course on the history of Port during your visit to the Douro Museum, then treat yourself to a tasting of fruity Moscatels and a hearty, rustic-style lunch at a family-owned wine estate. Delve into Portugal’s wine-growing history today by visiting the informative Douro Museum and the Quinta da Avessada wine estate for lunch. Included Excersions: Choice of Quinta do Seixo guided tour with tasting or Vineyard hike and tasting at a local quinta. Feel the centuries fall away as your ship winds its way through the pristine, dramatic, UNESCO-protected landscapes of the Douro River Valley. Head ashore for a choice of excursions, a tasting at a prestigious port wine estate or a vineyard hike with a wine tasting at a local quinta. As you cruise along the river today, take note of the little chapels you see along the banks. Though the river is slow and calm now that it has been tamed by dams, it was once extremely hazardous. These tiny chapels mark spots where entire rabelo boat crews perished attempting to get their cargo of Port wine to Porto. What adventures await you in Spain today? You can visit the historic university town of Salamanca—the “Golden City”—famous for its sand-colored buildings and abundance of churches, or immerse yourself in the region’s spectacular natural beauty, with a small boat cruise in a national park. The ship docks near the Spanish border today; you may head across the country to Salamanca or explore a fascinating natural reserve aboard a small boat. Go medieval today at Castelo Rodrigo, both the name of a hilltop castle as well as the village that surrounds it. The view from the top is incredible and the village is a charming place to ramble, relax and replenish. If you wish, you can also lace up your hiking boots and unleash your inner Indiana Jones with an up-close gander at some pre-historic carvings. Enjoy breathtaking scenery this morning as your ship cruises the upper Douro River Valley, which has been declared a World Heritage Site by UNESCO, both because of its beauty and its remarkable history. Although the river is considered one of the most pristine waterways in all of Europe, people have inhabited this region for 30,000 years. You may opt to visit Portugal’s first archaeological park, Foz Côa, or explore the comparatively “modern” Castelo Rodrigo, a medieval castle standing at the heart of a still-lively village, today. Included Excersions: Choice of Guimarães city tour or “Soul of Porto” Ribeira district walking discovery tour. Guimarães or Porto? That’s the question of the day today (you really can’t go wrong either way). Guimarães is the town where Portugal was born and its well-preserved architecture and stylish young residents make it a pleasure to visit. Or opt to explore one of Porto’s oldest neighborhoods, picturesque Ribeira, considered the soul of the city. A tough choice awaits you today: Do you venture off to historic Guimarães, Portugal’s first capital, or do you stay in Porto and explore the Ribeira district on foot? In the evening, a special Gala Dinner will be prepared for you. Disembark the ship and transfer to Porto Airport for your flight home, or extend your stay in Porto. Cultural enrichment, including a Signature Lecture: "The Magical Douro River Valley"